The Highlands is an exclusive development in the village of Breckenridge. All homes are on acre plus lots with an abundance of forest around them. This home was designed to provide expansive views of the ski slopes and the Ten Mile Range. The two fireplaces offer a nice contrast to the snow-capped mountains and forest scenery surrounding our home. An open floor plan connects the kitchen, dining room, and living area on the main floor. Light and views surround this area. The master suite is separated by a short flight of stairs. Again, light and views are prevalent from this vaulted room. All three rooms on the lower walk-out level also have private baths. Another family room provides space for leisure and activities. Our home is non-smoking, and pets are not allowed. We take pride in making others feel comfortable about being in Breckenridge. Our home is warm and inviting and every effort is made to provide you with a special holiday experience. Please call us with any questions that might help you learn more about our home, about Breckenridge, about the Denver-Boulder area, about Colorado. We welcome a chance to share information with you. Bruce is a retired school principal, and Judy is a retired school librarian. Bruce now works for Mountain Angler in Breckenridge as a professional fly fishing guide. We value travel and friendship. ( We especially seek out independent travel that forces us to be creative). We give priority to our four grandchildren; other interests include bridge, reading, outdoor activities, and sharing with others. Bruce and Judy welcome you to their Breckenridge home. Bruce moved to Colorado from Iowa as a young boy. He grew up in Fort Collins and developed a love of the outdoors as a young lad. Fort Collins had open spaces and easy access to a world of adventure. He ran a small trap line on the Poudre and developed a love of fly fishing as a teenager. Judy grew up on a farm in Rocky Ford, Colorado. She and her sister and two brothers tackled all the tasks associated with a family farm. Bruce and Judy met at CSU (Colorado State University) in Fort Collins. Bruce became a school administrator, and Judy spent most of her career as a school librarian. After retirement, Bruce became a fly fishing guide for Mountain Angler in Breckenridge. They like to play competitive duplicate bridge, travel, bike, read, and Judy often fly fishes with Bruce. They always travel with their cribbage board. Bruce and Judy are parents to two children. Each is married and has two children. They are fortunate that both families live in Colorado. Our home lends itself well for sharing time with friends and family. It has an open floor plan where people can gather together. The views are outstanding. Each bedroom has a private bath. It's amazing to be in the outdoor hot tub when snow is drifting from above. Properties in The Highlands are on acre+ lots. Trees are abundant and the setting is ideal. One has very expansive views and lots of open space. Dining table can seat 10. Heated Garage. There is a separate study. A hot tub is accessible from the lower level. First time at Breckenridge, nice mountain and we loved the way the Epicpass tracks your runs. Not crazy about the food in most of the mountain restaurants, but that's not unusual. Found the people in the town friendly, even though it was near the end of the season. We parked at the airport free parking as recommend by the Spinney's and took the shuttle. It was convenient, especially avoiding the post skiing day traffic. The views from the home's large windows that face the resort are stunning, both sunrise, sunset and moonset were beautiful. The bedrooms are nice, though if you're used to premium sheets, you may want to bring them. There is radiant floor heating through out, so you stay toasty right down to your feet. I would absolutely recommend this property, the Spinney's are great to work with. Thanks Bruce & Judy. Lovely Home, Amazing Views, and Incredible Location! Judy and Bruce were an absolute pleasure to work with. We reserved their Breckenridge home 6 months prior to our arrival. Judy and Bruce knew that we weren't familiar with the area and decided to surprise us with bi-monthly information packets! The packets would include local newspapers, information about ski rentals, local magazines, and more! Such a lovely gesture! From the moment we arrived on December 24, the home exceeded our expectations. Judy and Bruce left us a welcome basket (hot chocolate, wine, snacks! ), and we found Christmas gifts under the Christmas tree for the young child in our group (!). Their home is perfectly located in town and offers incredible views, comfortable beds, and beautiful bathrooms. We thoroughly enjoyed the framed views of Breckenridge mountain from the living room and saw three moose and a number of unusual birds from the kitchen window. We spent several days skiing and snowshoeing, and the house was perfectly setup for these activities. This is the best rental our family has ever stayed at, and we cannot wait to return! Thanks again, Judy and Bruce. You went above and beyond! The home was great, Bruce and Judy were very nice to deal with. They made every effort to help us to be comfortable in their home. The locatin was incredible. It was just up the mountain from downtown Breck, yet felt very remote. The views alone were worth the trip. Judy's bird feeders were a big hit with our entire group. We had a fox walk through the yard one evening. We were very happy with our choice, this home is awesome! Very nice and very well kept. Close to the mountain and all the amenities of town, but not walking distance. Owners were very accommodating and attentive. I would absolutely stay here again, accommodated three families with ease. Absolutely beautiful home close to the town of Breckenridge but located in a quiet hillside suburb. Spacious enough for the whole clan to get together to watch TV or enjoy a meal in the large, open kitchen. The heated 2-car garage kept our vehicles snow free and our skis and boots warm for starting the day. Our children, their spouses and grandchildren made this a truly memory-filled New Years' holiday for us. The owners, Judy and Bruce were super nice to deal with and provided us with extra amenities like snowshoes and a extra air bed for our use. 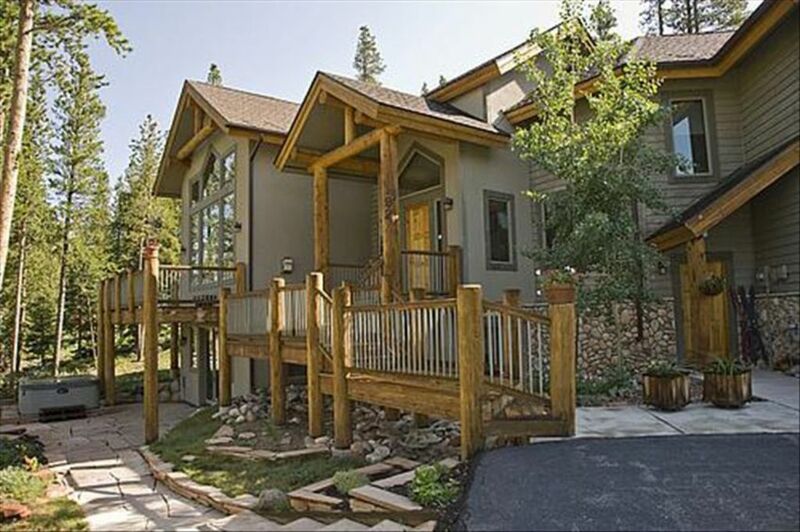 Breckenridge is a prime location for both winter and summer living. It is known as one of the best resorts in the United States, offering a wide array of activities. Denver is 80 miles to the east, and Vail is 35 miles to the west. Lake Dillon is within 10 miles, and mountain excursions are out your back door.